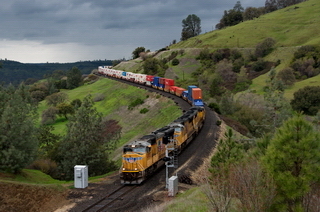 The former Western Pacific Railroad traverses through the Feather River Canyon between Portola and Oroville, CA. This is breathtaking and relatively unknown scenery. The WP was taken over by the Union Pacific over thirty years ago, so I never got to see the line as WP. As close as I can get it to the real thing is the Western Pacific Railroad Museum in Portola (check out that gallery here), which is well worth visiting if you’re in the area. The WP that I have come to know is under the Armour Yellow of the Union Pacific, and it’s still a remarkable line to photograph. I had started to put some of my images from the former WP into the UP, and came to the realization that they might well get lost in there. They need to stand on their own! So, there’s something new on Laughing Frog Images – the UP on the ex- Western Pacific Gallery. I tend to get less than ideal weather in the Feather River Canyon, and the photos reflect that. However, life isn’t always blue skies and sunshine – and I’ve never been one to put the camera away if I’ve made the journey and the time to photograph something. Sometimes, I’ve felt that the sun takes the same time off that I do, but digital photography has made that much easier to deal with than it was in the days of ISO 64 Kodachrome! The BNSF has trackage rights over the WP, and that will be a separate gallery as well. I contemplated that idea for a while, and for similar reasons, decided to make that its’ own gallery. At some point in time, there are two more galleries coming that are related to the WP. These will be of the eastbound and westbound trips of the 2014 Feather River Express as viewed from the train. (Yeah, I know, I promised those a while ago, but they’re still works in progress! ).